When I made the easle card for my 3D class a couple of weeks ago, I also made another 2. Want to see?? Here is the first one! I made this one portrait. It is a standard A6 size card. I stamped the Upsy Daisy in chocolate chip and then clear embossed it so it stands out more. I found this project on Dawn's blog and just had to give it a go! You can click HERE to see the tutorial. It will hold around 6 cards and envelopes so it would make a lovely gift for someone. I thought I would use the new in-colours (I should stop saying 'new' as the in-colours have been around for a few months now!!). I'm really loving this blue (Pacific Point), even though I am a 'pink' girl, in real life, this blue is stunning. So vibrant. Stamps: Best Yet (level 1 hostess). Paper: Pacific Point, Kiwi Kiss, Good Morning Sunshine DSP. Accessories: 5/8" Pacific Point Striped Grosgrain Ribbon, Scallop Circle Punch, 1 3/8" Circle Punch. This photo didn't come out all that clear so I'm sorry about that. I made this for my new recruit, Brenda who decided to join me doing what we love doing - stamping! Brenda is a fantastic scrapbooker so I might just be able to get some pointers from her and maybe do some more pages!!! LOL. Welcome Brenda! Here is a close up of those gorgeous felt flowers - Flower Fusion Too. The colours in this container are: chocolate chip, pink pirouette & baja breeze. Flower Fusion has pumpkin pie, old olive & rose red. Click HERE to see them. Paper: Old Olive, Chocolate Chip, Pink Pirouette, Baja Breeze, Pink Pirouette Pattern DSP. 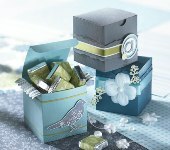 Accessories: Flower Fusion Too, Silver Brads, 5/8" Striped Grosgrain Ribbon. Okay, so I think this card is a little busy for me but it is growing on me. I really love the sentiment stamp - it is a level 1 hostess set so if you place a $300 order, this could be yours (along with 5 other sentiments). 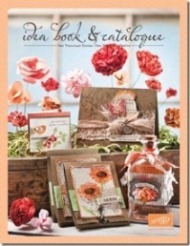 Check out pages 16-23 of the Idea Book & Catalogue to view all the hostess sets available when placing orders. Stamps: Fifth Avenue Floral, Best Yet. Paper: Urban Oasis DSP, Baja Breeze, Kraft, Kiwi Kiss. Accessories: 1/4" Black Grosgrain Ribbon, Linen Thread, 1 3/8" Circle Punch, 1 1/4" Circle Punch, 1/16" Circle Punch, Dimensionals.